Foundation Medicine plans to provide comprehensive genomic profiling for eligible veterans living with advanced cancer under a five-year, $111.5 million contract awarded by the U.S. Department of Veterans Affairs. The contract, awarded under the Veterans Affairs National Precision Oncology Program (NPOP), encompasses all of Foundation Medicine’s available tests—including FoundationOne CDx and FoundationOne Liquid for solid tumors as well as FoundationOne Heme for hematologic malignancies. “We are starting work with the VA to operationalize the contract and plan to make testing available to participating VA medical centers as quickly as possible,” Foundation Medicine said in a statement to Clinical OMICs. The National Precision Oncology Program aims to help veterans access new investigational targeted cancer therapies via clinical trials. The Program began national implementation in July 2016, a year after the VA's New England Healthcare System and the Massachusetts Veterans Epidemiology Research and Information Center launched a clinical program to help veterans who were newly-diagnosed with non-small cell lung cancer. During the first three quarters of 2018, more than 2,400 samples were submitted for next-generation sequencing (NGS) via the Program, according to an October 30 presentation at the National Academy of Medicine’s National Cancer Policy Forum by Michael J. Kelley, MD, National Program Director for Oncology, VA, and a professor of medicine at Duke University Medical Center. According to the abstract of a study presented at the 2018 Association of VA Hematology/Oncology (AVAHO) Meeting, held September 28-30 in Chicago, 3,981 samples have been sent for NGS, of which 3,036 samples were sequenced successfully and 597 failed—a success rate of 83.57%. The top diagnosis was lung cancer, seen in 1,333 samples—of which 917 were sub-classified as adeno, 283 squamous, and 133 non-small cell. Other cancer diagnoses included colorectal (307), prostate (297), skin (154) and head and neck (75). A total 158 patients had been prescribed 225 of the recommended treatments, of which 130 were prescribed before the NGS results date, and 95 after. Of the successful samples, the study showed, 99 were liquid biopsies and 2,880 had treatment recommendations via IBM Watson for Genomics, the AI-based platform designed to provide variant information and updated clinical content to help molecular pathology laboratories carry out precision oncology. The Program has expanded from four participating facilities at the time of national rollout during Q1 2016 to 51 facilities in Q3 2018. The average number of samples sent per month grew to 182 in 2018, from 105 in 2017. “The higher volume has been facilitated through improvements in NPOP’s data infrastructure. Additional [Veterans Health Administration] patients can benefit from NGS gene panel testing to guide therapeutic decisionmaking,” the study concluded. The VA hopes to bolster participation in the Program through the tests offered by Foundation Medicine, which was acquired by Roche for $2.4 billion in a deal completed in July 2018. FoundationOne CDx is a comprehensive genomic profiling assay designed to detect substitutions, insertion and deletion alterations (indels), and copy number alterations in 324 genes and select gene rearrangements. It is also designed to detect genomic signatures, including microsatellite instability and tumor mutational burden, using DNA isolated from formalin-fixed paraffin embedded (FFPE) tumor tissue specimens. FoundationOne Heme is designed to detect all classes of genomic alterations in more than 400 cancer-related genes—namely hematologic malignancies and sarcomas including, but not limited to, leukemias, myelodysplastic syndromes, myeloproliferative neoplasms, lymphomas, and multiple myeloma. In addition to DNA sequencing, FoundationOneHeme employs RNA sequencing across more than 250 genes to capture a broad range of gene fusions, common drivers of hematologic malignancies, and sarcomas. 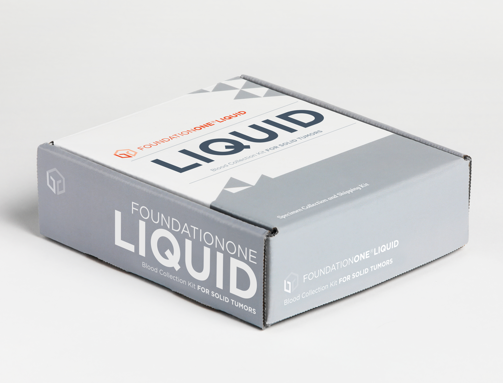 In September 2018, Foundation Medicine launched FoundationOne Liquid, a blood-based liquid biopsy test for solid tumors that is designed to analyze 70 genes known to drive cancer growth, including homologous recombination deficiency (HRD) genes, then report the genomic biomarker for microsatellite instability (MSI), with the goal of helping inform decisions to use of checkpoint inhibitor immunotherapies and multiple targeted therapies, including poly (ADP-ribose) polymerase (PARP) inhibitors, as well as clinical trials for patients with advanced cancer.